cycloneye wrote: The FV3-GFS upgrade will now occur on March 20 2019 pending successful 30-day technical tests. Look at the replies to the tweet. I don't know how it does with tropical systems but the FV3-GFS has been an unmitigated disaster for mid-latitude weather this winter. Even RaleighWX was mocking it. Here is a snow map for 2/16 from 0z 2/12 https://www.tropicaltidbits.com/analysi ... 200&fh=126 showing me with 10" of snowfall on what turned out to be a partly cloudy day in the 40s. Please no. Hopefully they keep the old model running. Your link is for todays latest 126 hr FV3. Not the past. deriving snowfall will exhibit excessive snowfall values. 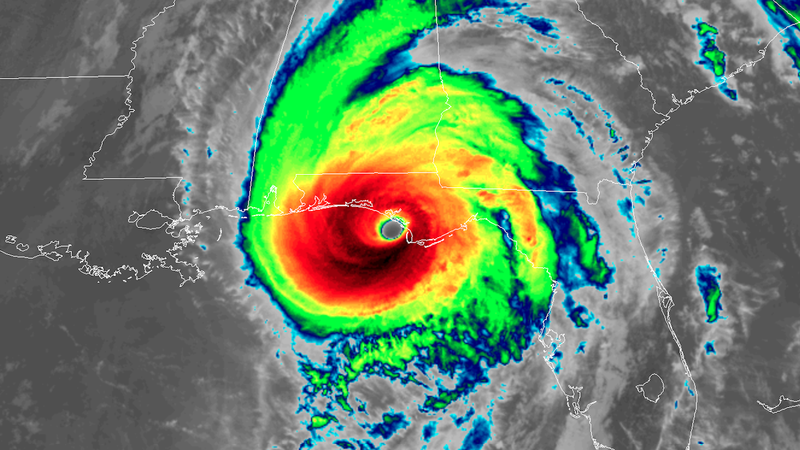 that became more prominent after late September 2018. Bottom line is that it's a cold-biased snow-mongering model for the Gulf Coast. wxman57 wrote: Bottom line is that it's a cold-biased snow-mongering model for the Gulf Coast. Could make for some fun April-May Subtropical genesis modeling LOL. "...... as the deepening low approaches the Cedar Key area, warm core transition looks to rapidly take place and inland snow flurries over extreme S. Georgia quickly changing back over to light rain in advance of T.S. Andrea's slow approach from the SSW...."
Maybe something subtropical forms in the next few days in Central Atlantic? cycloneye wrote: Maybe something subtropical forms in the next few days in Central Atlantic? Nice something to watch for anyways. Timeframe isn't that far out and model support from GFS and Euro. Obviously the odds are against it this time of year but could we get a way early pre-season surprise? Want to see some real entertainment? 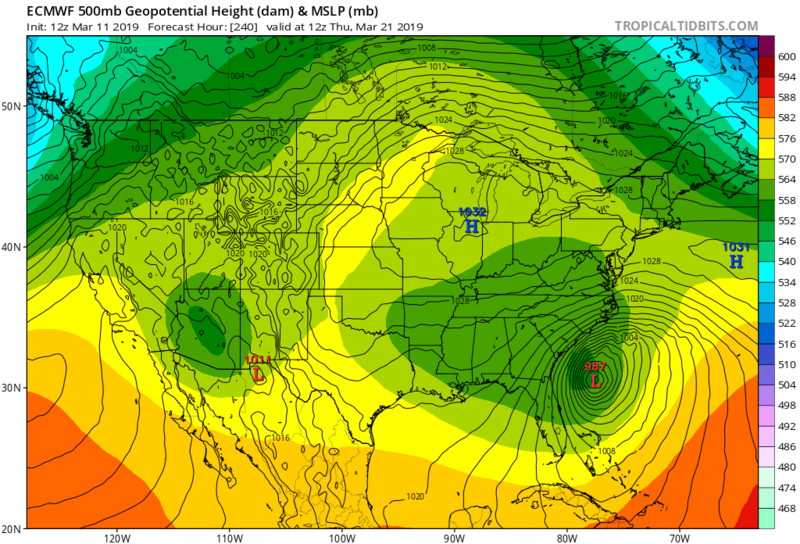 Check out what the Euro has just off the SE U.S. coast at day 10 on its 12z run. Crazy huh? The following post is NOT an official forecast and should not be used as such. It is just the opinion of the poster and may or may not be backed by sound meteorological data. It is NOT endorsed by storm2k.org. ^ The signal is there though, with the GFS also showing a low (granted, much weaker) in that vicinity during the same time frame. Don't think it'd be tropical, but something that bears watching? AdamFirst wrote: ^ The signal is there though, with the GFS also showing a low (granted, much weaker) in that vicinity during the same time frame. Don't think it'd be tropical, but something that bears watching? Saw the GFS showing something similar although weaker, but it definitely looks frontal one way or another. It’s just interesting that it originates from the Bay of Campeche. GFS was showing this back on Friday its long range. The model dropped it, and now has brought it back. The 12Z EURO now develops this closer to the Southeast U.S. coast within the next 10 days and deepens the system to 987 mb. Still a bit skeptical on this being a strong system, but will watch it the next few model run cycles. I think this potential system, if it develops, will most likely be a weaker hybrid, as climatology just is against this, but hey stranger things have happened. TheStormExpert wrote: Want to see some real entertainment? Check out what the Euro has just off the SE U.S. coast at day 10 on its 12z run. Crazy huh? Yeah apparenlty a monster area of low pressure is supposed to form in the Mid-West in the near future. Some energy breaks off from that down in the Gulf. A low forms in the Gulf and rides up the East Coast. Obviously a long way out but something to keep an eye on. Would be crazy if it verifies. ICON is on board as well. As for it originating down in the BOC......, that is rather interesting. Perhaps a harbinger of how our Tropical Season might just kick off a bit early over the upcoming month or two? 1900hurricane wrote: That's a baroclinic low. I live right along the coast of NC. Should be a pretty potent 'Nor'Easter' if this verifies. We don't really need any rain/wind right now ground is still saturated from Florence and the deluge of rain that has followed in the last few months. Somewhat similar to the March 12-14, 1993 "Storm of the Century". Not nearly as strong in the Gulf, though. You can look back at those maps here. Use the calendar button top right of the website to go back to 1993.
wxman57 wrote: Somewhat similar to the March 12-14, 1993 "Storm of the Century". Not nearly as strong in the Gulf, though. You can look back at those maps here. Use the calendar button top right of the website to go back to 1993. Amazing how much that low deepened in that short period of time?! Early on the 12th, that surface feature in the N.W. Gulf looked so innocuous. Great news about the next ECMWF upgrade. Some tropical or at least subtropical development look possible on S-ATL on the weekend or early next week. 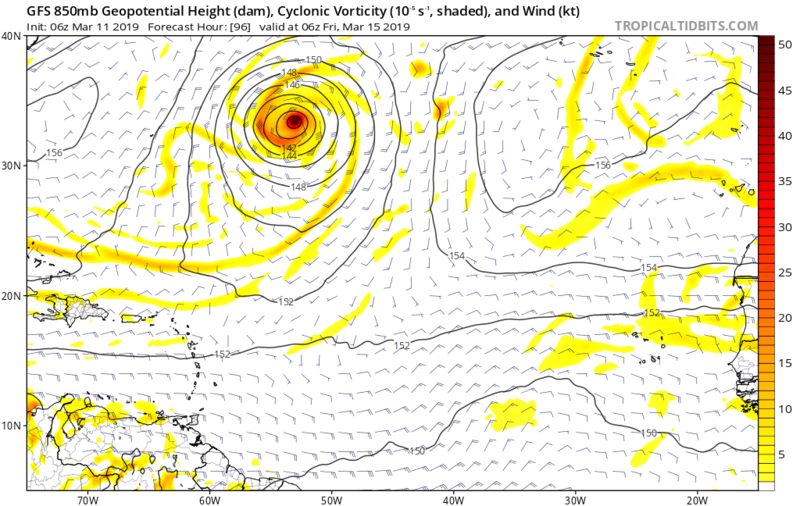 The GFS is very agressive and shows a hurricane now and in the yesterday 12Z and 18Z runs too. 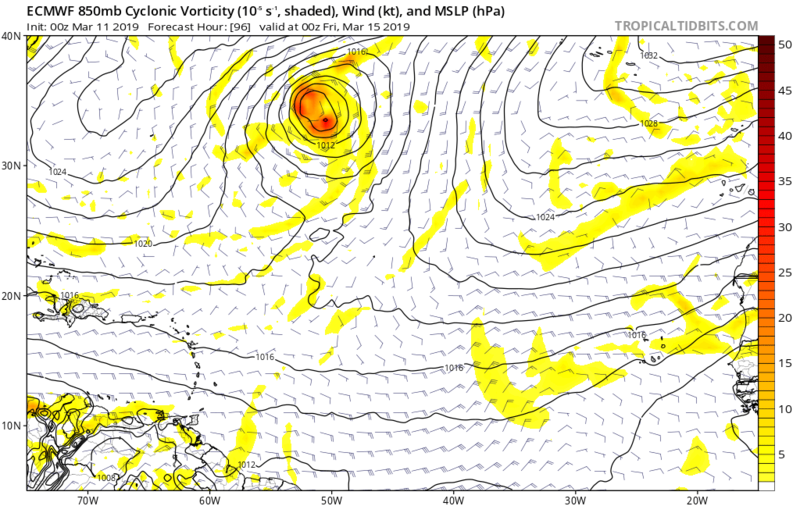 The ECM and GEM also develop the cyclone, but only to a weak tropical storm.